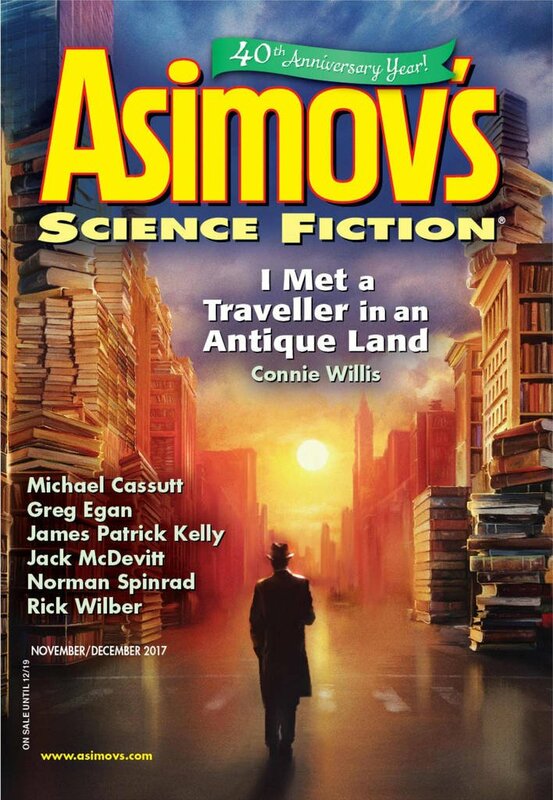 "Love and Death and the Star that Shall Not Be Named: Kom&apos;s Story," by James Gunn [bio] (edited by Sheila Williams), appeared in Asimov's Science Fiction issue 11-12|17, published on October 19, 2017 by Penny Publications. Pro: This is a personal-development story. Kom returns from Sirius B transformed by his experience with Sam. Con: This isn’t a real story and doesn’t even try to be. It’s the prelude to the real story and simply provides background info about Kom. Nearly the entire thing is told through narration, making it cold and distant. The science is pretty bad. A satellite of a gas giant would only spend hours in eclipse, not days. The opposite hemisphere wouldn’t experience eclipse at all. And Sirius cannot have habitable planets because the white dwarf companion hogs the entire habitable zone.